A basic understanding of some major plant components will help you understand the causes behind specific growth problems, and what precautions can be taken to solve them. The vascular system is the 'plumbing' system in a plant. It carries or “translocates” substances throughout the plant. It is broken into 2 distinct sections. ● Translocating sugars to specific areas in the plant to be either stored or used in the process of respiration (see below). ● Translocating starches that were stored in roots and stems during dormancy. ● Translocating growth regulators and systemic agents. 2) ‘Xylem’: This is used to translocate water, nutrients and oxygen from the roots to the rest of the plant. (See Fig 18.1) ‘Parenchyma' cells are cells that photosynthesise. These are concentrated on the upper surface of the leaf. ● Carbon dioxide, water and oxygen (during photosynthesis and respiration). ● Foliar sprays such as fertilizers and systemic fungicides. 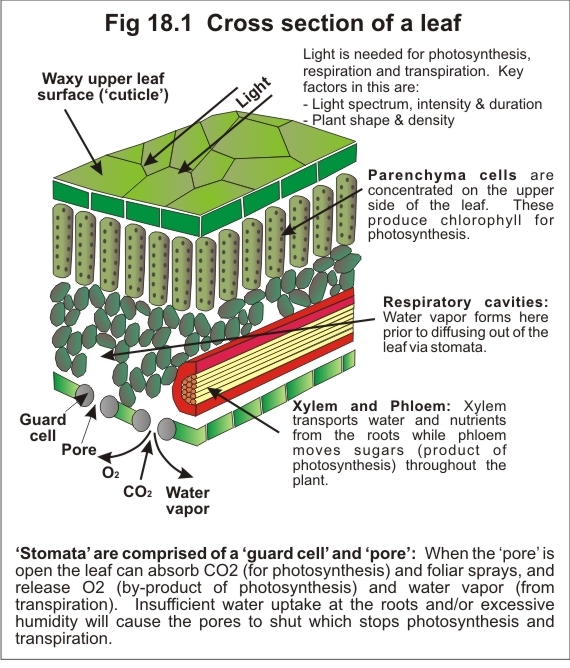 Xylem and phloem are located within the leaf for translocating water and nutrients to the leaf cells and for the removal of sugars. Roots facilitate the uptake of water, oxygen and nutrients. 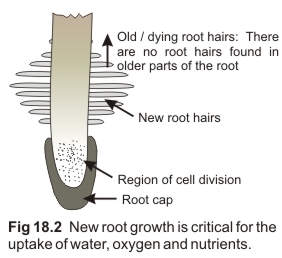 Root ‘hairs’ are located close to the growing tip of each root and are responsible for the majority of the uptake of oxygen, water and nutrients. They are alive for just a few days and cover about 10mm of a roots overall length at any given time. The uptake will be greatly affected if the growth of root hairs is restricted.